Few franchises in the history of sports have had as many stars as the New York Yankees. Love them or loathe them, there's no denying the collectibility of players like Babe Ruth, Mickey Mantle and modern icons, such as Derek Jeter and Don Mattingly. We're counting down the ten most collectible New York Yankees of all-time. The list doesn't necessarily reflect the most valuable players, because then we'd be bringing up obscure autographs from when the team was in its infancy. Rather, this list acknowledges the lasting impact players have had on the hobby as a member of the Yankees. You know you're important to the hobby when a company retires your jersey number in their flagship set. That's exactly what Topps did in honor of Mickey Mantle and what he did for the company. While Topps has since started producing card 7 again, every year it has been a tribute to the Yankees' slugger. Although there are other Yankees who have better career numbers than Mantle, he help mold the hobby into what it is today. Unlike older stars from the era before, many current collectors still recall his playing days and understand the Mantle magic firsthand. The 1952 Topps Mickey Mantle is the most iconic post-WWII card in the hobby, garnering thousands of dollars no matter the condition. 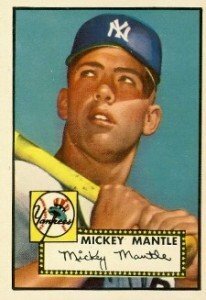 Even today, Mantle remains one of the top draws in the industry, getting top billing in any set that includes him. Mantle's autograph may not be as valuable as similar icons like Babe Ruth and Lou Gehrig, but that doesn't make it any less popular. Mantle was alive when the sports collectibles industry took off. Prior to his death, he was a frequent signer both at card shows and in card sets. A big part of the reason autographs and memorabilia from earlier stars are more valuable is simply because they're more rare, coming from a time when signatures had personal value and weren't really seen as investments or commodities. Mantle isn't one of those. He indirectly helped invent the sports memorabilia industry. And for that, he's the most collectible Yankee of all-time. Babe Ruth is arguably the best and most recognizable player to ever put on the pinstripes. Heck, he's probably the most iconic player in baseball history. However, he came from a different era--an era that's now in the distant past. Few alive today had a chance to see Ruth play. Instead, he lives on in folklore and legend. Baseball cards are a part of that folklore, but because there wasn't a hobby back in his playing days, Ruth doesn't have the same connection with collectors as Mantle. Nobody will debate that Babe Ruth changed baseball and helped make it America's game. The sport's first genuine slugger, Ruth had a larger-than-life personality that went along with his bulky build. One of the first sports celebrities, Ruth drew crowds wherever he went. He was one of the country's most beloved figures. Yes, autographs from the Babe are among the most valuable in the industry. Yes, his memorabilia cards command a lot of attention, but Babe Ruth does not have a direct connection with the modern industry. His current cards are rare and more of a novelty rather than something every collector can get. Also, if you compare the number of unique Ruth cards to Mantle cards, it's not even close. While Ruth's cards are impressive, with more than 4,000, Mantle nearly triples that with more than 11,000 cards. While today's contracts and licenses make that data somewhat debatable, the fact is that while Ruth may be the greatest Yankee, he's not the most collectible. Outside of the hot rookie of the day, is anyone more collected in baseball today than Derek Jeter? I don't think so. With more than 3,000 hits, five World Series wins and 12 All-Star appearances to his name, Jeter is the face of the Yankees' last great run. He may not have the power numbers and outlandish stats as other players who have came and gone since he debuted with the Yankees in 1995, but Jeter has been the team's leader through it all. Jeter has also been in the middle of two major hobby trends of the last decade or so. When the graded card craze took off in the early part of the new millennium, the 1993 SP Baseball Derek Jeter became one of the most sought after slabs. The foil design is notorious for chipping, making mint copies worth a ton and gem mint specimens exponentially more. A testament to the card's continued iconic status, Upper Deck inserted 93 buyback autographs of the card in 2009 SP Authentic. These cards continue to sell for more than $1,400 when they pop up. In July, one sold for $2300. The 2007 Topps Derek Jeter card set off a trend of gimmick cards. Featuring crudely Photoshopped additions of then President George W. Bush and late legend, Mickey Mantle, the card got a ton of mainstream publicity. People began snatching it up, driving up prices based on speculation. While the values eventually leveled off, they still sell well. More importantly for the hobby, the card proved that gimmicks moved cards so they became a staple for several years. While there's still the occasional novelty card today, this trend has since shrunken back. With all signs pointing to Jeter being a career Yankee, there's also a throwback appeal to his collectibility. Having stayed largely reclusive, despite numerous high-profile relationships, Jeter has managed to avoid a lot of media prodding. However, the recent revelation of alleged Jeter gift baskets with an autographed baseball for his one-night stands have added another level to the Jeter mystique. From record-setting hitting streaks to a high-profile marriage to Marilyn Monroe, Joe DiMaggio had a way of capturing America's attention. He also had a knack for winning. In 13 seasons, the Yankee Clipper helped his team win nine World Series Championships. A 13-time All-Star and three-time MVP, DiMaggio is remembered today in large part due to his 56-game hitting streak in 1941. But like Ruth, DiMaggio's prime came just before the hobby took shape. As a result, most of his cards look back on his career instead of documenting it. Prior to his death in 1999, DiMaggio was a favorite on the autograph circuit. He signed a lot of them over the years. 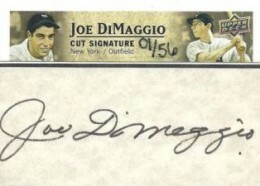 These may autographs have made Joe DiMaggio cut signature cards popular in many modern releases. The last early star on the list, Lou Gehrig is not only one of baseball's all-time greats, but he's also one of the most beloved. Baseball's original Iron Horse, Gehrig played in 2,130 consecutive games between 1925 and 1939. In 1999, Gehrig garnered the most votes from fans for the MLB All-Century Team. In 17 seasons with the Yankees, Gehrig won six World Series and was the AL MVP twice. He hit 493 career home runs while hitting .340. When Lou Gehrig was struck down with amyotrophic lateral sclerosis, which is now more commonly called Lou Gehrig's Disease, both his career ad life were cut short. Gehrig's "Luckiest Man on the Face of the Earth" farewell speech in 1939 remains one of the most iconic and dramatic moments in baseball history. 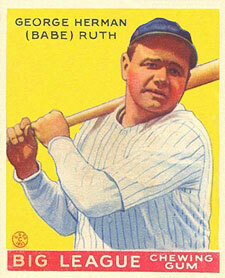 Because Gehrig played before baseball cards hit the big-time, he falls into the same group as Ruth and DiMaggio. Although respected by the hobby, he doesn't have the same connection with the hobby as others who may not have the same stats. High-end Gehrig pieces bring in huge dollars, however they're extremely rare and pricey. If you have a Gehrig autograph, consider yourself lucky. Despite the popularity of cut signature cards, through 2011, Gehrig has less than 120 after totaling up each card and their print runs. 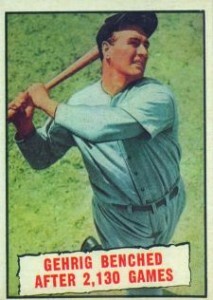 Gehrig's 1933 Goudey cards are considered his rookie cards. Although Yogi Berra is one of the greatest catcher's of all-time, it's his over-the-top personality and memorable quotes that have made him the collectible icon he is today. A three-time MVP, Berra hit 358 career home runs. Once his playing days ended, Berra stayed active in the game as both a coach and manager. In total, Berra appeared in 21 World Series, winning 13 of them. Collectors can thank Berra for many of today's sports clichés. "It ain't over 'til it's over," "It's like déjà vu, all over again," and "90 percent of the game is half mental," are all examples of classic Yogiisms. Since his 1948 Bowman rookie card, Berra has appeared on early 3,500 different cards. He has been a popular choice in modern sets that have retired player components. Berra has also signed for many baseball card sets over the years, which has kept prices in check considering his legendary status. Don Mattingly will never make the Hall of Fame for his playing career. However, he was one of the hobby's cornerstones when baseball cards boomed in the 1980s. The 1984 Donruss Don Mattingly remains one of the most iconic cards of the decade. While Mattingly put up good umbers for his career (.308 batting average, 222 home runs), he can't be regarded in the same breath as Ruth, Mantle, DiMaggio and other top-tier Yankees. Playing in the Bronx, there's also an expectation for winning. Mattingly failed to take the Yankees to a World Series Championship. Because he was a major star in the modern hobby, many of today's collectors still have fond memories of the nine-time Gold Glove winner. He remains a popular choice for retired player card content, autographs and memorabilia. "Mr. October" had a thing for drama. He was a big and brash figure on the baseball landscape, winning five World Series in the 1970s, including two with the Yankees in 1977 and 1978. Although one of the best players of his generation, it was Jackson's three home runs in Game Six of the 1977 World Series that helped him attain legendary status. After signing on as a spokesman for Upper Deck in 1990, Jackson helped launch both the insert and autograph crazes. His 1990 Upper Deck High Numbers autograph was the first pack-inserted signature in the hobby. Since then, Jackson's autographs and memorabilia have continued to be a staple in many sets. Because he's such a willing signer, autograph prices are reasonable. Sometime in the near future, Alex Rodriguez might be regarded as baseball's all-time home run king. He's already had a Hall of Fame career. And although Rodriguez is one of the most collected players in the hobby today, he's also one of the most loathed. His status as an iconic Yankee is further hindered by the fact that he spent a significant amount of time with the Mariners and Rangers before. 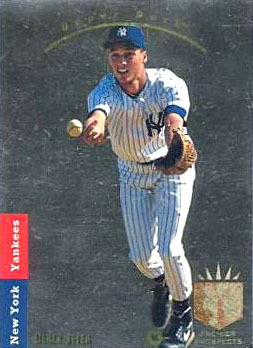 Similar to Jeter's 1993 SP rookie, the 1994 SP Alex Rodriguez played an important role in the graded card craze. It also had foil issues that make mint and gem mint versions extremely rare and very valuable. Rodriguez's reasonably priced 1994 rookie cards in Upper Deck, Fleer Update, Collector's Choice, Sportflic Rookie/Traded and Flair will likely take off as Rodriguez approaches major career milestones and records in the near future. Like Gehrig, Munson had his career and life cut short. The 1970 AL Rookie of the Year, Munson was one of baseball most respected catchers. As captain of the Yankees, Munson helped lead New York to World Series Championships in 1977 and 1978. On August 2, 1979, Munson was killed in a plane accident while practicing to land his small plane. A beloved leader, Munson remains popular among collectors. However, his autographs are tough to come by and command high prices. And while Munson does appear somewhat regularly on memorabilia cards, there aren't a ton. Munson's rookie card hails from 1970 Topps Baseball. Limiting a list of all-time collectible Yankees is tough. As great as players like Roger Maris, Dave Winfield, Mariano Rivera and Whitey Ford are, they simply don't have the same following in the hobby as those on this list. Others, such as Rickey Henderson, Roger Clemens and Randy Johnson do have the hobby respect but their impact came away from the Yankees. I burn every Yankee card I get…might reconsider this policy if I had Ruth or Mantle….don’t get mad just making your Yanks worth more. Obviously I’m a Yankee hater, but I’ve burned Jeter RCs and even a Munson RC. Not a Yankee in my collection!!!!!!!!!! Go Tigers! This year’s divisional series was AWESOME! ALCS not so much. 1994 (10) Upper Deck Future Foundation Derek Jeter #644 Lot. Nice Investor set!